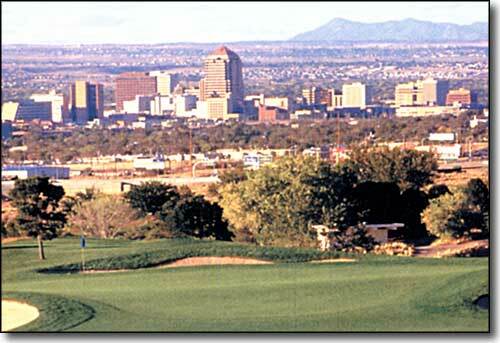 The Championship Course at the University of New Mexico is one of the highest rated college golf courses in the country. The course features rolling fairways and undulating greens and is dotted with bunkers, water hazards, elevated greens and tees, arroyos, and ridges. This well manicured course has hosted many big tournaments, including collegiate, PGA and LPGA qualifying events. Excellent practice facilities include a driving range, practice greens and bunkers, and a three-hole beginners course. As host of the 1992 and 1998 NCAA mens' national golf tournaments, the course has seen such names as Tiger Woods, Phil Mickelson and Tim Herron during their college careers. Reservations may be booked as far in advance as you wish with a valid credit card. Rates vary from $26-$67. Call the golf shop at 505-277-4546 to reserve individual tee times or to find out more about group and corporate golf outings. Most text and all photos are copyright © 2002 by University of New Mexico Championship Golf Course.